1 tecumseh | This Blog Rules | Why go elsewhere? Sarah Winchester, the widow of the gun magnate William Wirt Winchester sure seems to be surrounded by a spooky curse. 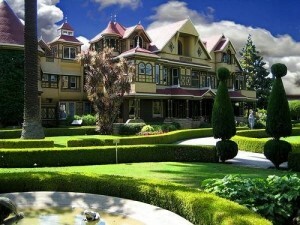 After her husband’s death in 1881, Sarah began construction on what is popularly known as the Winchester Mystery House. Sarah was successfully convinced by a psychic that the house was haunted by all the people who had been killed by her husband’s guns! So Sarah got to work. She had staircases built in the house that led to nowhere, doors to concrete walls, and many other such absurdities. Why? To confuse the ghosts! The House built is a huge sprawling thing with 160 rooms which include 40 bedrooms! It is said that Sarah believed that if she kept building she could evade death which eventually came for her in 1922. The end result of her curse? A delightfully strange house you can visit in San Jose, California.